Recover and copy data from corrupted DVD for reading the content on any player and device. Scratches appear on a disc probably attributing to its fragility, poor preservation or frequent use and kick up difficulty or even impossibility to read the content via a DVD player. Sometimes, data can be regained through cleaning, waxing or polishing discs to remove dust and small damages. But bad sectors on a disc can make data inaccessible because of permanent damage. For severely scratched DVDs, how to achieve data recovery? 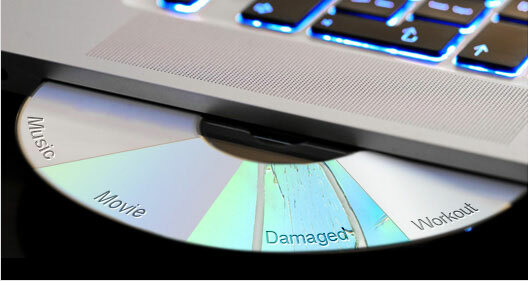 We will introduce 2 ways which can help perfectly recover data from corrupted DVD. • Rip corrupted DVDs to MP4 (H.264), AVI, WMV, MOV, FLV, 3GP etc, with complete data (whole movie, TV episode etc.) while keeping high quality. • Remove copy protections like Sony ArccOS bad sectors, CSS, region code, RCE, UOPs, Disney DRM and other complex schemes for getting a digital copy with ease. • Adjust parameters - bit rate, resolution, frame rate, aspect ratio, audio sample rate, audio channel etc. - for other purposes like online uploading, playback on special devices. DVD data recovery software is developed to bring ease and convenience when you attempt to recover data from a corrupted DVD. Tons of software ensures that a flawless and secure solution is employed to copy all data from discs with zero loss. Which one is a favorable choice? CD Recovery Toolbox is picked up as a recommendation that is a freebie available to support damaged DVD, HD DVD, CD and Blu-ray discs. It focuses on restoring information caused by physical injury like scratches, chips, spots on surface or incorrect recording on the boot sector. Unreadable or lost data recognized by DVD drive can be recovered from DVD. 1. Insert a corrupted DVD and run CD Recovery Toolbox after it is installed on your computer. 2. Select the drive with damaged DVD and click Next button. 3. Select target directory where you want to store files and click Next button. 4. Files found on your DVD will be listed. Check certain or all files you want to recover and click Save button. 5. The log of the recovery process will be presented. If there is no error message, it means that the data has been recovered from corrupted DVD. Now, you can exit this program. CD Recovery Toolbox can search the possible maximum amount of information for recovery. But, not all information can be found and recovered depending on the level of damage. 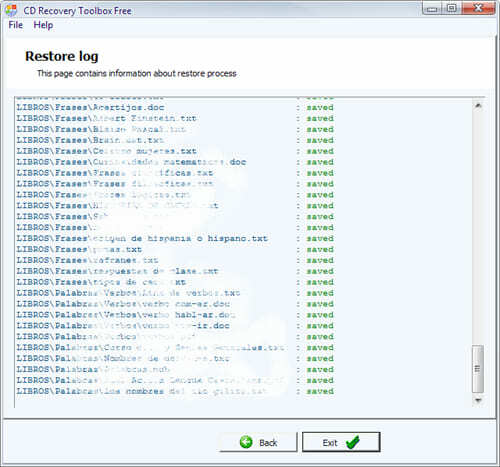 Notice: CD Recovery Toolbox is only available for Windows. Difference from DVD data recovery software which digs out all files contained in DVD for recovery, we can convert DVD to digital, especially for movies/TV shows, with DVD ripping software making the data readable on any player and device. WinX DVD Ripper Platinum is an expert in DVD digitization. It supports a wide range of DVDs, from movies/TV shows to workout discs, music discs and some other special ones. No matter whether the disc is pretty old and corrupted, it can copy whole data from DVD as a digital file in MP4 (H.264), AVI, WMV, MOV, FLV, 3GP etc, acceptable by various devices, players and websites. And, it can 1:1 copy corrupted DVD to VIDEO_TS folder, ISO images or turn the disc as a single MPEG2 file with all subtitle/audio/video tracks or selected audio/video tracks. The utilization of Level-3 Hardware Acceleration greatly enhances ripping performance. With integration of Intel QSV an NVIDIA NVENC, WinX DVD Ripper Platinum can deliver an extremely fast speed (5 minutes in maximum on the basis of hardware) to rip a feature-length DVD to MP4. What's more, the quality of resulting file will be kept at a high level and even lossless. Free download and install WinX DVD Ripper Platinum on your computer. Now, follow the steps to recover data from corrupted DVD by digitizing the disc. Step 1. Insert the corrupted DVD into DVD drive. Launch WinX DVD Ripper Platinum and click DVD Disc button. A dialogue box pops up asking you to select the source DVD. Generally, the disc will be automatically selected. Keep DVD Disc File System Type as Auto Detect. Click OK. Step 2. All titles of the DVD are loaded and main title is auto-checked. Meanwhile, Output Profile window appears. Select an output format. 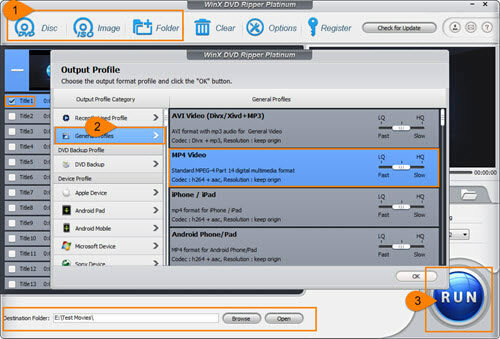 For example, if you want to rip corrupted DVD to MP4, go to General Profiles and select MP4 Video (Codec: h264+aac). Next, click OK. Step 3. Click Browse button to set a destination folder. Then, click RUN button to start digitizing the corrupted DVD with full data.